The owners of Italian club Udinese say their attempt to take over Watford is still at a "premature" stage. The Hornets had stated the Pozzo family had acquired the club from current owner Laurence Bassini "in principle". But the family have released a statement through the Udinese website. "The Pozzo family wishes to clarify that any current news or rumour relative to the acquisition of Watford Football Club should be considered premature," it read. "While there is a concrete interest, the negotiation has not yet reached the point of being officially signed off with the signatures of the parties on the contracts. 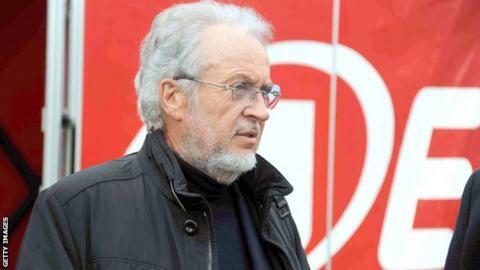 "Further information and news developments will be announced by the Pozzo family as soon as they occur." Speculation in the Italian media has linked former Chelsea striker and West Ham boss Gianfranco Zola with a role at Vicarage Road, should the takeover go ahead. And Gino Pozzi, the son of Giampaolo, who owns Udinese and Spanish side Granada, has been quoted by La Gazzetta dello Sport as saying: "Zola is part of the project, but it's premature to talk about it." The Watford Supporters' Trust has urged the prospective owners not to use the Hornets as a platform to give experience to Italian youngsters. "I would expect that if they take over that we would see Italian loan players come in," Trust chair Professor John Fawell told BBC Three Counties Radio. "But my hope would be they are better than what we had and not just there in order to get experience." Pozzi bought Spanish side Granada in 2009 and has since used the club to farm out young talent from Udinese. The result has been positive for Granada, who won promotion to La Liga 12 months ago and narrowly managed to hold onto their place in Spain's top-flight after a relegation battle. Fawell's concerns about a similar arrangement at Watford have been echoed in a statement from the Trust. "There is a strong possibility that [Pozzo] would want to bring some of Udinese's younger players on loan to Watford, which is what he has done with Granada," it read. "This has implications for (manager) Sean Dyche's control over player recruitment and the academy development of young players. "If they have to be played under instructions from the owner, who currently seems to see Udinese as the focus of his operations, then this would be bad and we would simply become a nursery club for Udinese." However, Fawell is hopeful that the takeover, which is expected to see Gino run affairs at Vicarage Road, will benefit the club in the long term. "We would welcome a period of stability and a period when owners buy into the Watford way of doing things," he said. "We would also welcome owners who are prepared to support and continue the academy." Confirmation of the sale would see Bassini end his 15-month ownership of Watford. His tenure has been shrouded in mystery at times and while he bought the Hornets for £440,000, the level of his investment is unknown. "We have no way of knowing until somebody opens any of the books his particular company has," added Fawell.